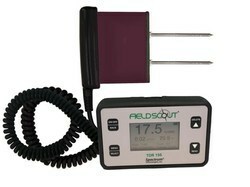 FieldScout TDR 350 Soil Moisture MeterManage water responsibly and reduce operating expenses. The TDR 350 portable soil moisture meter offers the performance that you have come to recognize for more than 15 years. Offering the same proven time-domain measurement technology, the TDR 350 accurately measures soil moisture across the full range of soil moisture conditions. With new enhancements, the TDR 350 provides significant improvements in performance and measurement accuracy for optimal turf conditions. Measurements: The new TDR 350 has increased accuracy to measure Soil Volumetric Water Content (VWC), along with Soil Electrical Conductivity (EC), and soil surface temperature. Integrated: With integrated Bluetooth and GPS, no additional parts are necessary for Bluetooth connectivity and geolocation of readings. Using the FieldScout Mobile App, available for both iOS and Android, measurements can be automatically uploaded to SpecConnect with your FieldScout® Pro subscription for visualization and data analysis. Display: An industry exclusive, larger backlit LCD display provides optimal contrasts for daylight and low light viewing, and larger digits for easier viewing of measurements. Receive instant readings – no smartphone or computer hookup required! Design: The TDR 350 has an ergonomic design with a shaft-mounted probe that is a telescoping tubular frame. This allows users to easily and rapidly take many measurements in various turf and soil environments. The TDR 150 portable soil moisture meter offers the performance that you have come recognize for more than 15 years. Offering the same proven time-domain measurement technology, the TDR 150 accurately measures soil moisture across the full range of soil moisture conditions. 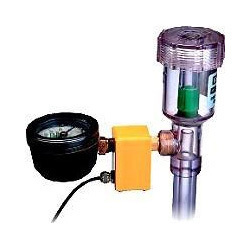 Obtain soil moisture readings at the press of a button. With variable rod length options, measure soil moisture at your ideal root zone. With new enhancements, the TDR 150 provides significant improvements in performance and measurement accuracy for optimal soil conditions. With new enhancements, the TDR 150 provides significant improvements in performance and measurement accuracy for optimal soil conditions. Measurements: The new TDR 150 has increased accuracy to measure Soil Volumetric Water Content (VWC), along with Soil Electrical Conductivity (EC), and soil surface temperature. Data logging: Large capacity data logger can record approximately 50,000 measurements. Data records can be saved to USB stick. Design: The TDR 150 has an ergonomic handle attached to the sensor block. This allows users to easily and rapidly take many measurements in various soil environments and is ideal for measuring containers on benches. With variable rod length options, measure soil moisture at the ideal root zone. Announcing the new, next generation FieldScout®TDR 350 Soil Moisture Meter from Spectrum Technologies, Inc.
performance that you have come to trust with the FiedScout®brand as your trusted tool in the field for more than 15 years. improvements in performance and measurement accuracy for optimal turf conditions. The key is knowing both when and how much to water! NEW Calibration feature: Sensors with "3/14" code can be re-calibrated using the FieldScout Soil Sensor Reader (item 6466) or the WaterScout Calibration Device (item 6470CAL3V). Please see the product manual for calibration proceedure. Manufacturer : Spectrum technologies. The watermark soil moisture sensor is an established method of tracking soil moisture trends in crops, vineyards, or other areas where moisture level is a concern. Place sensors in the upper and lower thresholds of the root zone, in turf, or in other growing media. Reads moisture from 0 (saturated) to 200 (dry) centibars. Includes 6-ft cable. Manufacturer : Spectrum Technologies Watermark Sensor Digital Reader 6455. Place a Watermark sensor in the root zone of your crop or turf and use the handheld Digital Meter for an instant reading or moisture from 0 (saturated) to 200 (dry) centibars. 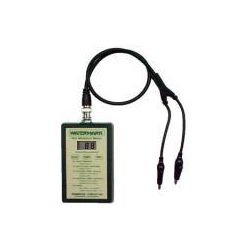 The Watermark adapter makes these Watermark sensors compatible with our Watch Dog weather stations and data loggers. 6450WD Watermark Soil Moisture Sensor 6ft. 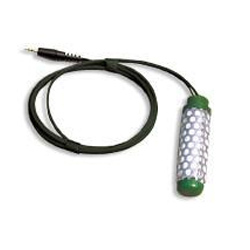 6450WD20 Watermark Soil Moisture Sensor 20ft. 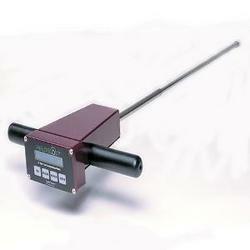 Soil Moisture Transducers allows the user to make use of the dial gauge for real-time measurements. In accordance with set industry standards and norms, we manufacture the product with advanced technology and tools procured from our reliable vendors. The product gives us much appreciation from our valuable clients who not only love our products but praise us for the quality-based and fine finished products that are available to them on time. Manufacturer: Spectrum Technologies adapts to new and exisiting irrometer tensiometers. Allows the use of the dial gauge for real-time measurements. Maximum of two per logger. Accuracy is /-2%. Made in compliance to set industry standards, we manage to offer Soil Compaction Meters to our clients. It is widely appreciated for fast and accurate measurements. It monitors overall soil compaction quality and durability with the digital penetrometer. These meters are used to detect the density of the soil. Our supervisors ensure that the product is highly efficient for the clients and reaches them on time. Manufacturer: Spectrum Technologies Identify soil compaction with this digital compaction meter (penetrometer). Fast and accurate measurements and integrated data logger. Funtions with geo-reference (GPS/DGPS) tools. Soil Compaction Meter SC-900.Monitor overall soil compaction and quality, quickly and effectively with this digital penetrometer.The #1 source of yield loss in agriculture, soil compaction prevents moisture penetration, reduces fertilizer and chemical utilization and hinders plant root growth. In some cases, yield losses can run as high as 30% due to soil compaction. Don't let it go unnoticed.Soil Compaction meters (oftencalled penetrometers) are used to determine the density of soil and other material. An operator pushes a rod with attached (ASAE standard) cone into the ground. The resistance of the cone as it is pushed in the ground is measured and recorded in the memory of the compaction meter. The depth of thecone below soil surface is also measured and recorded in memory.Compaction data is recorded at displayed, at one inch intervals, in PSI or kPa. Built-in datalogger eliminates the need to record data manually. Included software allows user to download data, change logger settings and configure themeter.Measure, log, and review data with the SC-900 Soil Compaction Meter to make better soil management decisions based on data specific to your field. Identify and address specific problem areas on-site and in real time.